Home lock out service is one of the most popular emergency services our locksmiths can provide you in a short time. It usually happen when people move in or out a new home. It can also happen when you are in a rush during your busy day and your mind somewhere else. When you wake up in the morning late, you’re stress and moving fast to be able to reach your office as soon as possible. You quick make a cup of coffee to put it in the cup holder of your car. After placing your coffee in the cup holder, you go back to your home to take your bag. You try to open the door, and suddenly you realize that you’ve locked yourself out of your home. What I’m gonna do now, you think to yourself. You think about your options around the house and you find out ll the windows are shut closed. All your doors and windows are locked. You stuck outside, not a good way to start your day, so what can you do now? Your best option is to call us for aid. 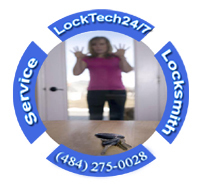 We are 24/7 mobile locksmith services providing residential locksmith and lock out services in Allentown, Bethlehem, and Easton PA.
Our locksmith always available to come out soon when they get your call for help. We use the latest picking tools and we’re able to open almost any lock in the U.S market today. Furthermore, unlocking doors is our specialty and our locksmiths are an experts in what they do, locksmithing. Whether unlocking house door or apartment door, and either front door or back door, we can help. As a matter of fact, we can unlock a file cabinet or desk in your house. Let us unlock your door and your day within 20 minutes, and let us be your emergency lock out assistance in Allentown and the Lehigh Valley PA. These are just a few examples of brands and locks we can unlock. Picking a lock is the art of a locksmith. Our high skilled locksmiths can pick your lock fast and easy. No worries, no long waiting, and no extra charge for emergency service, call us now. You can also enter our Residential Locksmith Services to read more.